Pontoon21 Kalikana Vib 58 - Description, Wholesale at Europe (EU). Fishing tackle retail and wholesale in Europe (EU) - Angler's Zone. Kalikana typical bypasses are very clear in this case. The shape of Kalikana Vib resembles pelagic fish – big sunbleak or bleak. Kalikana Vib has a common feature of all Pontoon21 Vibs – a finlet on the back made of resilient plastic. This finlet creates vibrations in vertical and horizontal retrieves. It doesn’t break - the plastic is resilient and thick enough. 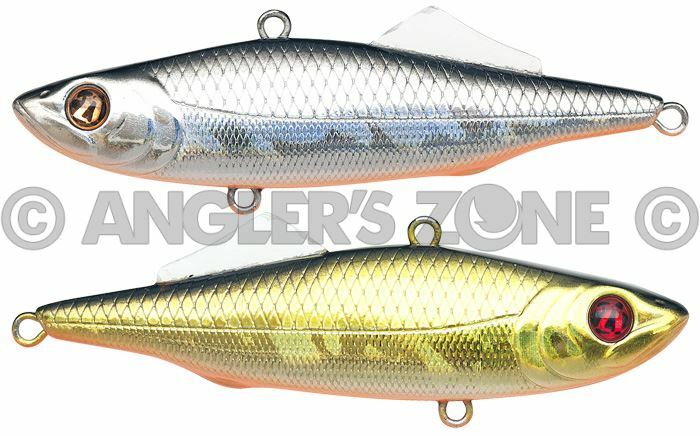 Kalikana Vib is a deep diving rattlin that works perfectly and make fish bite even when it is situated right under the boat. The interesting thing is that if you take into account your experience of using this vib in vertical fishing, you may achieve great results while fishing edges especially if the place is deep enough and has a good current. The retrieve should be more delicate than usually in cases of vib fishing with spinning rods. Short jerks and big pauses will be a perfect presentation. Nowadays, Bet-A Vib and Kalikana Vib are the only representatives of Vibration lures in the world, designed, first of all, for vertical fishing. They perfectly work in different depths. As long as they have a smaller item weight than their analogs, in vertical fishing (from ice as well as boat) these rattlins swing to different sides when you raise them and lower them. Unlike balancers, Kalikana Vib moves more delicately and smoothly. And very often it is this action that provokes predators, first of all, zander and perch. Kalikana Vib makes fish bite even when balancers and spoons don’t work. In vertical fishing Bet-A Vib and Kalikana Vib have an interesting peculiarity. After drop both models are capable of floating quite effectively. They swing on one side, and then move aside, vibrating at the same time. Among all rattlins, only these models possess these qulities. In air winter summer rattlin Kalikana Vib takes a horizontal position. And it keeps this position in water. Kalikana Vib moves and turns in water a bit slower than Bet-A Vib. Unlike Bet-A Vib, in vertical fishing Kalikana floats a bit farther and lies down, turning from side to side, which attracts predator from afar. Kalikana Vib comes in two variants according to the noise they emit: with a special capsule (NanoSound – NS in its name) and without it (Silent – SL in its name). Kalikana come in three sizes and different colors. There are 15 colors for every model, including Doublet – one side is golden, the other one is silver. They are equipped with treble hooks Owner ST-36BC and high-quality split rings. Hard Baits For All Seasons. V.I.B - Very Important Bait! Pontoon21 Bet-A Vib and Kalikana Vib new sizes!